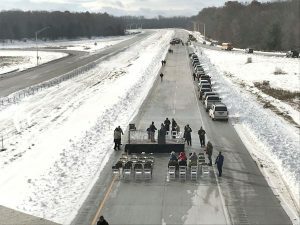 SOMERSET – Frigid air and biting winds greeting those attending the U.S. Route 219 extension ribbon cutting may have been appropriate, highway advocate G. Henry Cook, of Somerset, said after the program. Cook is CEO and Chairman of Somerset Trust Co. and has been promoting completion of the Route 219 four-lanes for decades. It hasn’t been easy, Cook and other leaders said during Wednesday’s program, held on the southbound lanes of the new highway just south of Somerset. He recalled a former state transportation secretary who was not in favor of the investment. “He said it would be a cold day in hell when this was built,” Cook said on Wednesday. Ron Aldom, executive director of the Somerset County Chamber of Commerce, said Wednesday’s milestone is huge.